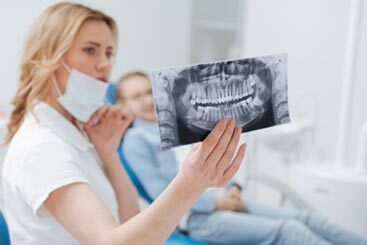 In some instances, in spite of our best efforts, the damage to a tooth is too extensive and it cannot be saved. This can happen as a result of periodontitis (late-stage gum disease), extreme tooth decay, or facial trauma that causes the teeth to break, among many other reasons. In those cases, we must extract the damaged tooth in order to protect the surrounding teeth and to ensure the continued overall oral health of the patient. When tooth extraction is the only option left, we make certain that we prepare the area for its subsequent restoration, be it a dental crown, dental bridge or a denture. Extraction is always the last course of action, though it may be necessary when the tooth is broken or significantly damaged, decay has reached the tooth’s nerve, or when periodontal disease has progressed to a point beyond recovery. Early intervention can help avoid this course of treatment in some instances (decay or periodontal disease), making us very big proponents of proactive oral hygiene programs. More often than not, maintaining good oral hygiene at home is the key to avoiding developing painful dental conditions like gingivitis, tooth decay, and cavities, which is why we strongly advocate for flossing daily and brushing your teeth at least twice per day. That way, our dentists and dental hygienists will only have to remove a small amount of tartar and take your dental x-rays when you come in for your semi-annual dental checkup. Contact us today if you are concerned about the state of your teeth or if you are due for your routine teeth cleaning appointment. We look forward to meeting with you!